The transcription factor NF-κB is of major importance in the biology of pro-inflammatory cytokines, such as TNF-α and IL-1α, and thereby is intimately involved in the process of inflammation. Understanding the mechanisms by which NF-κB is activated in response to inflammatory stimuli has become a major goal of inflammation research. The discovery of NF-κB-inducing kinase (NIK) as a TNFR-associated factor-interacting enzyme and a potential activator of the IκBα-kinase complex appeared to have identified an important element of the NF-κB activition pathway, a view that was supported by several subsequent studies. However, recent experiments in the alymphoplasia (aly/aly) mouse, which has missense point mutation (G885R) in NIK, has challenged that view. The reasons for the discrepancy between the different studies is unclear and could be due to multiple factors, such as cell type, species of cell, or primary vs transformed cell lines. One system that has not been investigated is primary human cells. Using an adenoviral vector encoding kinase-deficient NIK, we have investigated the role of NIK in LPS, IL-1, TNF-α, and lymphotoxin (LT) βR signaling in primary human cells and TNF-α expression from rheumatoid tissue. These data show that, in the primary systems tested, NIK has a restricted role in LTβR signaling and is not required by the other stimuli tested. Also, there is no apparent role for NIK in the process of TNF-α production in human rheumatoid arthritis. These data also highlight the potential problems in extrapolating the function of signaling pathways between primary and transfected cell lines. The NF-κB/Rel transcription factor family plays an essential role in the regulation of many cellular processes including inflammation, immune surveillance and response, cell proliferation, and apoptosis (1, 2, 3, 4, 5). Consequently, inappropriate levels of NF-κB activity have been associated with several human diseases including atherosclerosis, diabetes, cancer, and rheumatoid arthritis (RA),3 among other inflammatory disorders (1, 6, 7, 8, 9). NF-κB transcription factors achieve such diverse regulatory roles by modulating the expression of a large number of genes central to immune function and inflammatory response. 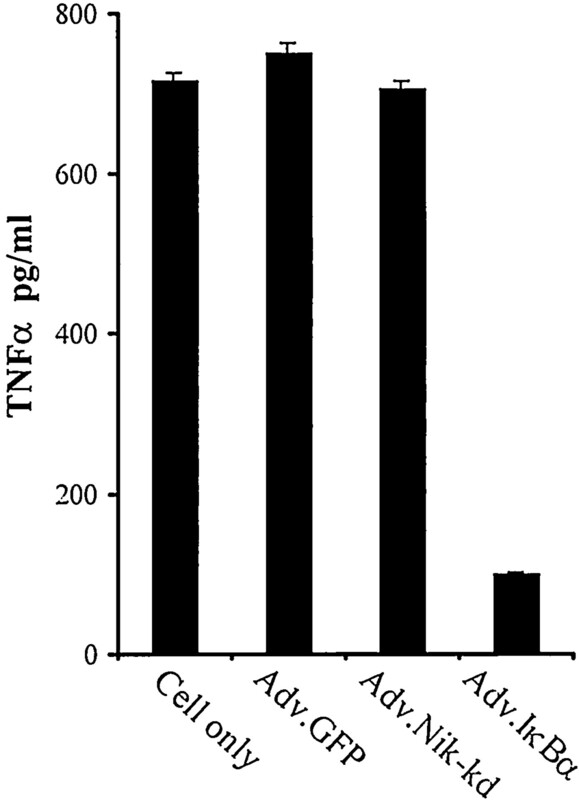 Indeed, the aberrant overproduction of TNF-α in RA is largely NF-κB dependent (10, 11). Therefore, it is not surprising that the NF-κB pathway has been subject to intense investigation over the last 10 to 15 years to facilitate the development of novel therapeutic strategies in combating disease (3). NF-κB is comprised of homodimers or heterodimers of a family of related transcription factors sharing a conserved sequence known as the Rel-homology domain: Rel A/p65, RelB, c-Rel, NF-κB1 (p50/105), and NF-κB2 (p52/p100) (1). In most cell types, NF-κB exists in a latent state in the cytoplasm, bound to one of a number of inhibitory proteins: IκBα, IκBβ, IκBε, p105, and p100 (7, 12, 13). The classical and best-studied form of NF-κB consists of a p50 and p65 heterodimer bound to IκBα. Upon exposure to a wide variety of stimuli, including TNF-α and IL-1, IκBα is phosphorylated on Ser32 and Ser36 and rapidly degraded by the ubiquitin-proteasome pathway (14, 15, 16, 17, 18, 19, 20, 21, 22). Degradation of IκBα unmasks the nuclear localization motif present on the p50-p65 NF-κB heterodimer, allowing nuclear translocation of the active transcription factor. Phosphorylation of IκBα is mediated by the IκB kinase (IKK) complex, which consists of two closely related protein kinases, IKK1 (IKKα) and IKK2 (IKKβ), and a regulatory subunit, IKKγ/NEMO/IKKAP-1 (23, 24, 25, 26, 27, 28, 29). The immediate upstream activators of the IKK complex remain undefined. Studies in transformed cell lines have suggested that atypical protein kinase C, mitogen-activated protein kinase kinase kinase 1 (MEKK1), or Cot/TPL2 may fulfill this role in response to diverse stimuli (30, 31, 32, 33, 34). The MEKK-related kinase, NF-κB-inducing kinase (NIK), identified via its interaction with TNFR-associated factor 2 (TRAF2), was demonstrated to be a key element of the NF-κB signaling pathway in response to TNF, IL-1, and CD95 (35). Moreover, NIK was used as bait in yeast hybrid studies to identify the first IKK (25). Overexpressed wild-type NIK interacted with IKK1 and IKK2 and increased IKK complex kinase activity and subsequent NF-κB function, in the absence of exogenous stimuli (26, 36). NIK was hypothesized to be the convergence point for NF-κB activation in response to TNF-α family or LPS/IL-1 Toll-like receptors via TRAF-dependent pathways (35). Furthermore, studies with a dominant-negative (NIK-kd) construct on a variety of stimuli, including CD27, IL-17, CD3/CD28, and dsRNA (34, 37, 38, 39, 40), suggested that NIK was a key kinase in signaling to NF-κB by numerous factors and that it might be a major element of the NF-κB pathway (26, 35, 36). However, the in vivo physiological role of some of these intermediates in cytokine signaling and inflammation remains controversial. Whereas knockout mice have substantiated the role of IKK2 and IKKγ in cytokine-mediated NF-κB activation and apoptotic protection (41, 42, 43, 44, 45), IKK1 has been shown to be dispensable (46). IKK1 appears to repress basal activity of the IKK complex and also plays an NF-κB-independent role in the regulation of keratinocyte differentiation (46, 47). The alymphoplasia (aly) mouse phenotype has recently been described to be due to an autosomal recessive missense point mutation (G855R) in the TRAF binding domain of NIK (48). Alymphoplasia mice display a systemic absence of lymph nodes and Peyer’s patches and disorganized splenic and thymic structures with immunodeficiency (49, 50, 51), a phenotype similar to that observed in lymphotoxin (LT)-α- and LTβR-deficient mice (52, 53). Alymphoplasia mice remain sensitive to LPS-induced endotoxic shock, and up-regulation of VCAM-1 in response to TNF-α in aly−/− mouse embryonic fibroblasts (MEFs) is intact (48). These data suggest that, in mice at least, NIK may be dispensable for proinflammatory activation of NF-κB, but it may play a role in the formation of secondary lymphoid structures in response to LT signaling. However, although not elaborated upon by the authors, Shinkura and colleagues (48) also found that, in human HEK 293 cells, the aly mutation does not preclude NIK from interacting with components of the TNF-α signaling pathway. Combined with the fact that catalytically active mutant NIK protein is present in the alymphoplasia mouse, these data do not allow definitive conclusions to be drawn about the role of NIK in TNF-α signaling or production. Therefore, it is still relevant and essential to determine the inflammatory role of NIK in primary human tissues to subjugate differences induced by species or transformation. The studies described here were undertaken to determine whether NIK played a proinflammatory role in the induction of NF-κB-dependent cytokines in physiologically relevant primary human cells, namely macrophages and inflammatory diseased human tissues (e.g. rheumatoid synovium). To achieve this, adenovirus constructs encoding NIK-kd were generated to deliver this inhibitor to primary human cells and tissues, and the activation of NF-κB in response to various stimuli was assessed. The adherent cell lines HEK 293 (Quantum, Montreal, Canada) and HeLa 57A (54) (gift from Prof. R. Hay, University of St. Andrews, U.K.) were cultured in DMEM containing 10% (v/v) FBS and 100 U/ml penicillin/streptomycin at 37°C and 5% CO2. Human monocytes were obtained from single donor plateletphoresis residues (North London Blood Transfusion Center, London, U.K.) and differentiated to macrophages, as described previously (10). Monocytes/macrophages were cultured in RPMI 1640 medium containing 5% (v/v) FBS and 100 U/ml penicillin/streptomycin at 37°C and 5% CO2. Primary human fibroblasts were a gift from Prof. J. Saklatvala (Imperial College, London, U.K.). Briefly, 1-mm tissue explants from human foreskin were cultured in a minimal volume of DMEM containing 10% (v/v) FBS to allow outgrowth of fibroblast cells. Cells were then expanded and maintained as low-passage stocks for experimentation. RA dissociated synoviocytes were isolated and maintained, as described previously (10). Recombinant LTα1β2 was obtained from R&D Systems (Oxford, U.K.). Expression vectors containing FLAG epitope-tagged (DYKDDDDK) wild-type NIK, kinase-dead NIK (K429A/K430A), and the pcDNA3 vector control were kindly provided by Prof. D. Wallach (Weizman Institute of Science, Rehovot, Israel) and were described previously (35). The adenoviral transfer vector pAdTRACK.CMV and adenoviral genomic vector pAdE1 were kindly provided by Prof. B. Vogelstein (Johns Hopkins Oncology Center, Baltimore, MD) and were described previously (55). pAdKS was derived from pAdTRACK.CMV by replacing its multiple cloning site with that of pBC SK+ (Stratagene, Amsterdam, The Netherlands). Briefly, the EcoRI site of pAdTRACK.CMV was destroyed by fill-in and re-ligation, creating an XmnI site. The multiple cloning site was removed via EcoRV/BglII restriction endonuclease digestion and replaced with the BssHII-flanked multiple cloning site of pBC SK+ by blunt-end ligation. The multiple cloning site of pAdKS is orientated such that the KpnI site is closest to the CMV promoter. FLAG-tagged NIK and NIK-kd cDNAs were excised from the pcDNA3 vectors using EcoRI/BglII and were incorporated directly into pAdKS. Plasmid transfections were routinely conducted using Superfect (Qiagen, Crawley, U.K.) according to the manufacturer’s instructions. The adenoviral vectors Adv.LacZ and Adv.IκBα, encoding Escherichia coli β-galactosidase and nuclear-directed porcine IκBα, respectively, were as previously described (10). The adenoviral vectors AdvIκBα andAdv.IKK2-kd were kindly provided by Dr. R. de Martin (University of Vienna, Austria). Adv.GFP, Adv.NIK, and Adv.NIK-kd adenoviral vectors were produced after pAdE1 in vivo recombination with AdTRACK.CMV, pAdKS.NIK, and pAdKS.NIK-kd, respectively as previously published (55). Recombinant genomes were transfected into the HEK 293 packaging cell line to yield mature recombinant adenoviral particles using Lipofectamine (Life Technologies, Paisley, U.K.) according to the manufacturer’s instructions. Adenoviral propagation to high titers and infections was as previously described (56). Adenoviral infections were optimized to achieve >95% efficiency for each cell type using Adv.LacZ, as described previously (10, 11, 57, 58). Immunoprecipitations directed toward FLAG-tagged NIK were performed according to the manufacturer’s instructions using 10 μl anti-FLAG M2 affinity gel (Sigma, Poole, U.K.). Abs used for Western blotting included the H-4 mouse monoclonal anti-human IκBα Ab (Santa Cruz Biotechnology, Santa Cruz, CA) and sheep antisera directed against human NIK (SAK14), generated using the synthetic peptide (VMEMAYPGAPGSAVGQQKEL) representing amino acids 3–22 (kindly provided by Prof. J. Saklatvala). For Western analysis, equal protein extracts were resolved by SDS-PAGE and transferred to polyvinyl difluoride membrane (Millipore, Bedford, MA). Blots were blocked for 1 h with blocking buffer (5% (w/v) fat-free milk, 0.1% (v/v) Tween 20 in PBS) followed by a 1-h incubation with the Abs, diluted 1:1,000 in blocking buffer. Blots were then incubated in HRP-conjugated anti-mouse IgG or anti-sheep IgG (DAKO, Cambridge, U.K.) diluted 1:2,000 in blocking buffer. Bound Ab was detected using the ECL kit and visualized using Hyperfilm MP (Amersham Pharmacia Biotech, Little Chalfont, U.K.). Secreted cytokines were harvested from cell supernatants as indicated and quantified by ELISA (BD PharMingen, San Diego, CA) according to the manufacturer’s instructions. After stimulation, cells were scraped into ice-cold PBS and lysed in hypotonic lysis buffer (0.125% Nonidet P-40, 5 mM HEPES, pH 7.9, 10 mM KCl, 1.5 mM MgCl2), and then the nuclei were harvested by centrifugation (13,000 × g for 30 s). Nuclear protein extracts were prepared by incubating the nuclei in hypertonic extraction buffer (5 mM HEPES, pH 7.9, 25% glycerol, 500 mM NaCl, 1.5 mM MgCl2, 0.2 mM EDTA) for 2 h with constant agitation. NF-κB DNA binding activities were determined by incubating 1 to 3 μg of each extract with [γ-32P]ATP-labeled double-stranded NF-κB consensus oligonucleotide (Promega, Madison, WI), followed by resolution on a 5% (w/v) nondenaturing polyacrylamide gel. Gels were dried onto filter paper and retarded DNA:protein complexes were visualized using Hyperfilm MP (Amersham Pharmacia Biotech). After stimulation, the medium surrounding the cells was aspirated and the cells were lysed (0.65% Nonidet P-40, 10 mM Tris, pH 8, 150 mM NaCl, 0.1 mM EDTA). Lysate volumes, of equal protein content, were corrected to 170 μl by addition of luciferase assay buffer (1% (v/v) Triton X-100, 25 mM Tris-phosphate, pH 7.8, 15% (v/v) glycerol, 1 mM dithiothreitol, 1 mM EDTA, 8 mM magnesium chloride, 0.5 mM adenosine triphosphate). Relative luciferase activities were determined over a 10-s period, after injection of 30 μl of 1.5 mM Luciferin (Sigma), using a Luminoskan (Labsystems, Chicago, IL). Recombinant adenoviruses containing NIK or kinase-deficient- kd-NIK (KK429/430AA) were constructed by first inserting the cDNA for both constructs into the modified pAdTRACK.CMV shuttle vector pAdKS. These were then incorporated into an adenoviral genome by in vivo recombination with pAdEasy1 in BJ5183 recombination-competent E. coli (55). The insertion of NIK or NIK-kd into the pAdKS shuttle vector had no effect on the ability of cDNA to either promote NF-κB activation or inhibit TRAF2-induced NF-κB activation when transfected into HEK 293 cells, respectively (data not shown). Transfection of the pAdKS.NIK and pAdKS.NIK-kd into HeLa cells demonstrated comparable expression levels to the original pcDNA3 expression vectors of Malinin et al. (35) (Fig. 1⇓A). NF-κB-dependent gene induction in HeLa 57A cells is NIK dependent. A, HeLa cells were transfected with the vectors as indicated; flgNIK protein overexpression was visualized by immunoprecipitation with M2-anti-FLAG affinity gel followed by Western blotting with anti-NIK Ab. B, HeLa 57A cells were infected with Adv.GFP, Adv.NIK, Adv.IκB, Adv.IKK2-kd, or Adv.NIK-kd as indicated (moi = 50) and left for 24 h to allow transgene expression. Cells were stimulated for 4 h with vehicle (□), 25 ng/ml TNF-α (▪), or 10 ng/ml IL-1α (▧). Cell lysates were then prepared and luciferase activities assessed (n = 3, ±SEM). C, left panels, HeLa 57A cells were infected with Adv.NIK, Adv.GFP, Adv.NIK-kDa, Adv.IKK2-kDa, or Adv.IκB as indicated (moi = 50) and left for 24 h to allow transgene expression. Right panels, Viruses coinfected to antagonize Adv.NIK (moi = 50) were infected with a threefold greater moi (150). Cells were stimulated for 30 min with diluent (control), TNF-α (25 ng/ml), or IL-1α (10 ng/ml) as indicated. Cytosolic and nuclear extracts were prepared. IκBα protein levels were determined by Western blotting, and NF-κB-specific DNA binding activities were determined by EMSA. To test the functional activities of Adv.NIK and Adv.NIK-kd, the HeLa 57A cell line, stably incorporating an NF-κB-dependent luciferase reporter gene, was used. Activation of these cells by either IL-1α or TNF-α induced the activation of NF-κB as judged by the induction of luciferase activity (Fig. 1⇑B) or the generation of NF-κB-DNA binding activity and IκBα degradation (Fig. 1⇑C). Adenoviral-mediated overexpression of NIK-kd in HeLa 57A cells was found to potently inhibit both TNF-α and IL-1α-induced luciferase activity after 4 h, compared with infection with the control Adv.GFP virus (Fig. 1⇑B). These studies are in agreement with previous work in which transfection of NIK-kd into cells has been used (35). The inhibition of NF-κB by NIK-kd was comparable to that observed with adenoviral-mediated overexpression of IKK2-kd or IκBα. Concomitant with the effect on the reporter gene, NIK-kd also inhibited IκBα degradation and NF-κB-DNA binding activity, as also seen with the IKK2-kd and IκBα constructs (Fig. 1⇑C). 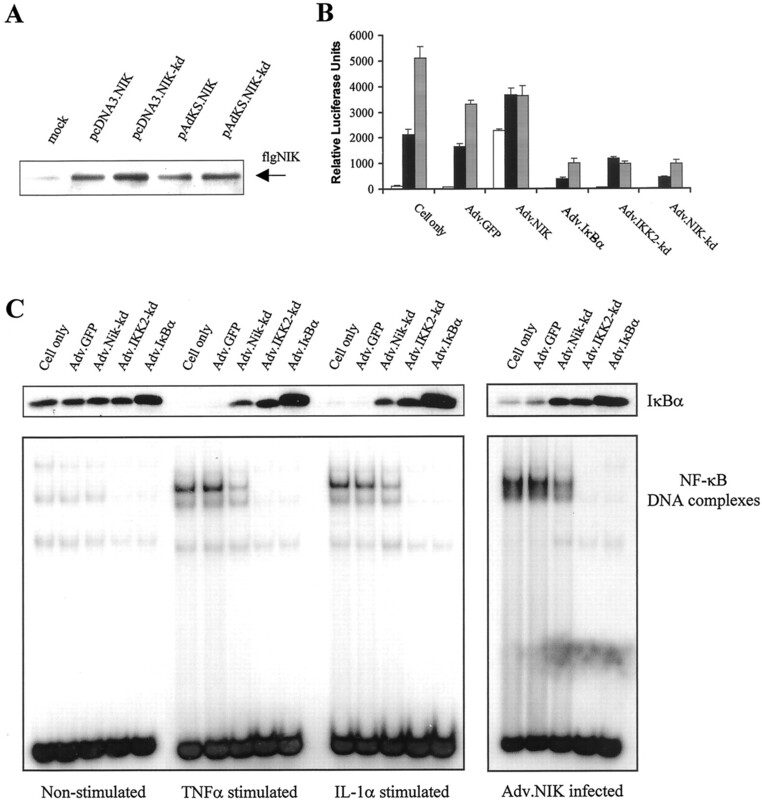 Adenoviral-mediated NIK overexpression was found to spontaneously induce NF-κB reporter luciferase activity in agreement with previous data using tranfected NIK (35) (Fig. 1⇑B). Similarly, adenoviral overexpression of NIK potently induced IκBα degradation and strong NF-κB-DNA binding activity, in the absence of exogenous stimuli, in these cells (Fig. 1⇑C). Coinfection of Adv.NIK with Adv.NIK-kd, Adv.IKK2-kd, or Adv.IκBα, but not with Adv.GFP, ameliorated these effects (Fig. 1⇑C), suggesting IKK2 to be a potential distal effector of NIK. The above studies demonstrated that adenoviral delivery of NIK-kd did not impair its inhibitory activity and confirmed data that had been obtained by others that suggested a central role for NIK in activation of NF-κB by TNF-α and IL-1α by transfection of transformed cell lines. However, the ability of adenoviral vectors to introduce transgenes into a variety of primary human cells and tissue (10, 11, 57, 58) allowed the role of NIK to be examined in these systems. Indeed, by using recombinant adenoviruses expressing green fluorescent protein (GFP), primary human macrophages are observed to be efficiently infected (>95%) at a multiplicity of infection of 100 (Fig. 2⇓). In contrast to the results in transformed cell lines, adenoviral-mediated expression of NIK-kd in primary human macrophages resulted in little effect upon LPS- or TNF-α-induced IL-6, IL-8, or TNF-α (LPS only) (Fig. 3⇓, A–C). Previously, the expression of these cytokines has been shown to be dependent on NF-κB (10, 11). Similarly, NIK-kd overexpression failed to inhibit LPS-, TNF-α-, or IL-1-induced IκBα degradation or NF-κB-DNA binding activity in these cells (Fig. 4⇓). However, these data could not be attributed to Adv.NIK-kd failing to infect the macrophages, as >90% of cells were seen to express GFP (data not shown). Furthermore, adenoviral-mediated overexpression of IκBα effectively prevented LPS-, TNF-α-, and IL-1-induced IκBα degradation and NF-κB-DNA binding activity in the same cells (Fig. 4⇓). Studies using higher virus titers of Adv.NIK-kd (up to a multiplicity of infection (moi) of 1000), still failed to inhibit LPS- or TNF-α-mediated cytokines beyond that of control Adv.GFP (data not shown). To exclude another possibility that NIK-kd could not act as a functional dominant-negative inhibitor in primary human macrophages, coinfection experiments were performed using wild-type NIK overexpression as the inducing stimulus. Adenoviral-mediated overexpression of wild-type NIK induced ∼2 ng/ml TNF-α 24 h postinfection compared with control virus (Fig. 3⇓D). 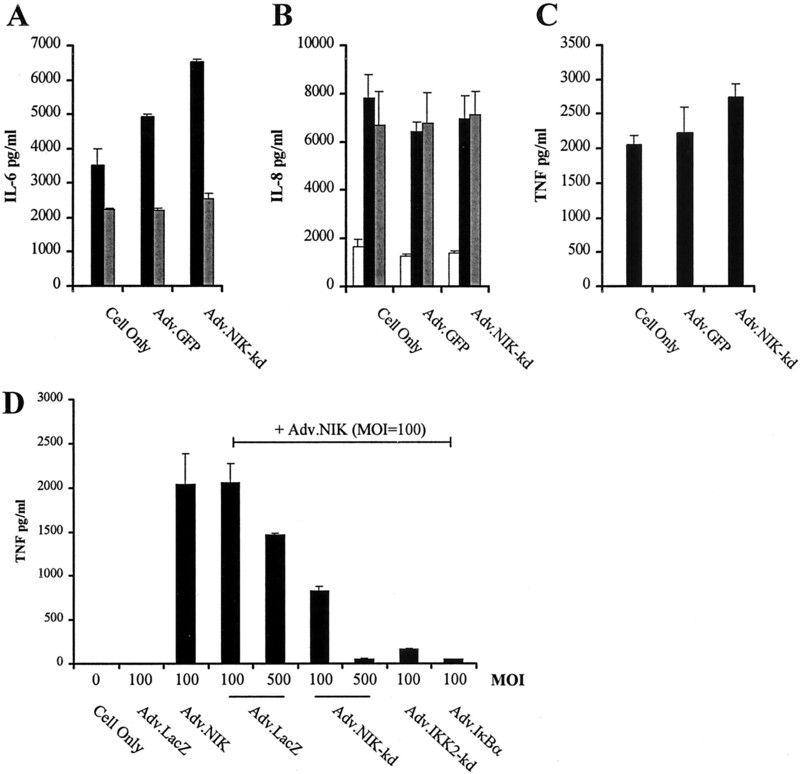 Wild-type NIK-induced TNF-α was inhibited by 50% when Adv.NIK-kd was coinfected at an equal titer (moi = 100), whereas the control virus had no effect (Fig. 3⇓D). Coinfection with a fivefold excess of Adv.NIK-kd (moi = 500) totally ablated NIK-induced TNF-α, although at this titer, the control virus did have a small effect (25%), suggesting that a small component of the NIK-kd inhibition at this higher titer may be due to a competition for virus entry into cells. NIK-induced TNF-α production was also effectively inhibited by Ικβα and IKK2-kd and was nearly complete at virus types of moi 100. The greater effectiveness of IKK2-kd and IκBα in blocking NIK-induced TNF-α is probably attributable to the increased efficiency of blocking the signal distal to the stimulus. 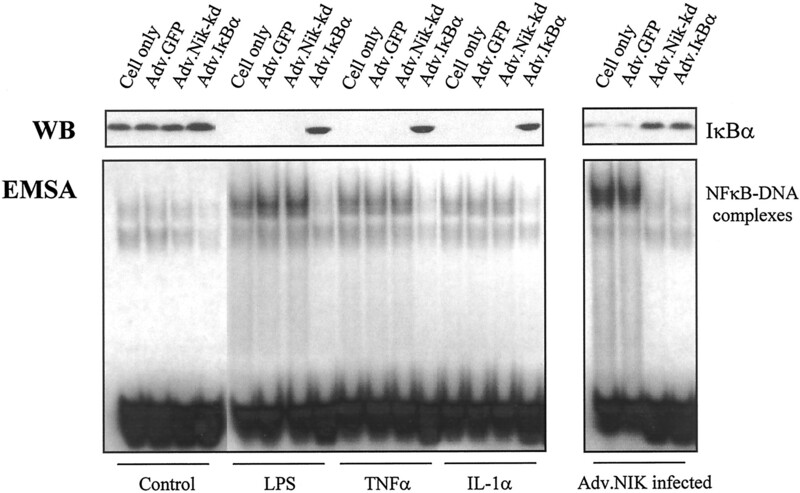 Similarly, studies on NF-κB showed that adenoviral-mediated overexpression of wild-type NIK strongly induced IκBα degradation and NF-κB-DNA binding activity in these cells (Fig. 4⇓). Coinfection of Adv.NIK with a threefold greater moi of Adv.NIK-kd, Adv.IKK2-kd, or Adv.IκBα, but not control Adv.GFP, inhibited these effects (Fig. 4⇓). Primary human macrophages are efficiently infected by recombinant adenovirus. Primary human M-CSF-differentiated macrophages were infected with Adv.GFP (moi = 100) and left for 24 h to allow transgene expression. Cells from the same field of view were viewed under normal (a) or blue light (b) to demonstrate infection efficiencies via GFP fluorescence. NIK is not required for LPS or TNFα-induced cyokine expression in primary human macrophages. A–C, Primary human M-CSF-differentiated macrophages were infected with Adv.GFP or Adv.NIK-kd as indicated (moi = 100) and left for 24 h to allow transgene expression. Cells were then stimulated for a further 24 h with vehicle (□), 10 ng/ml LPS (▪), or 25 ng/ml TNF-α (▦). Cell supernatants were collected and secreted IL-6, IL-8, and TNF-α levels determined by ELISA (n = 3, ±SEM). D, Primary human M-CSF-differentiated macrophages were infected with Adv.LacZ or Adv.NIK (moi = 100). In addition, cells were coinfected with Adv.NIK in conjunction with Adv.LacZ, Adv.NIK-kd, or Adv.IκBα (moi = 100 or 500, as indicated). Infected cells were left for 24 h to allow transgene expression before media were refreshed. Secreted TNF-α levels were measured after a further 24 h by ELISA (n = 3, ±SEM). LPS, TNFα, and IL-1α-induced IκBα degradation and NF-κB-DNA binding activity are NIK independent in primary human macrophages. 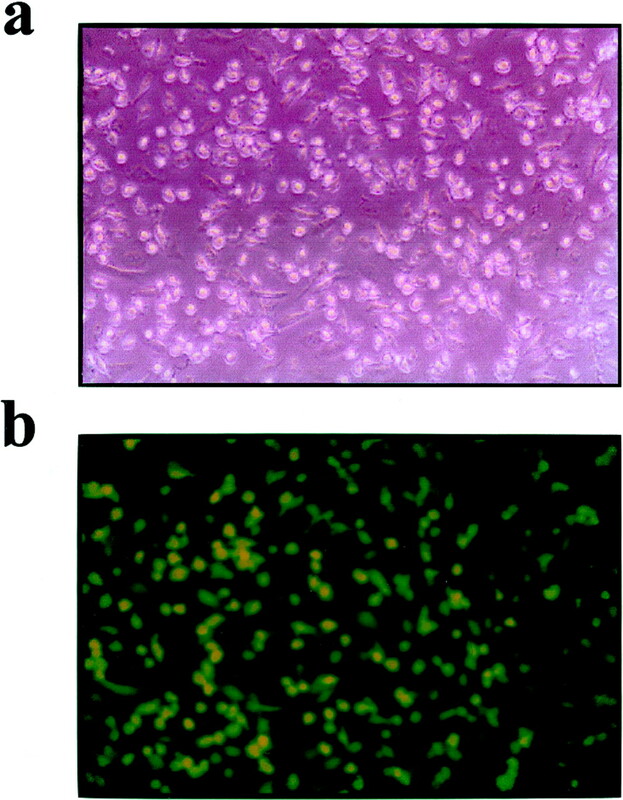 Primary human M-CSF-differentiated macrophages were infected with Adv.GFP, Adv.NIK, Adv.IκB, or Adv.NIK-kd as indicated (moi = 100) and left for 24 h to allow transgene expression (left panels). Viruses coinfected to antagonize Adv.NIK were infected with a threefold greater moi (right panels). Cells were stimulated for 30 min with vehicle (control and Adv.NIK infected), LPS (10 ng/ml), TNF-α (25 ng/ml), or IL-1α (10 ng/ml). Cytosolic and nuclear extracts were prepared. IκBα protein levels were determined by Western blotting, and NF-κB-specific DNA binding activities were determined by EMSA. The above data appeared to contradict a generic role for NIK in NF-κB activation that had been ascribed to the molecule by previous studies in transformed cell lines. However, it was possible that our results were particular to monocytic cells. Studies in another primary human cell system, HUVECs, also failed to show any role for NIK in LPS-, TNF-, or IL-1-induced NF-κB activation (M. Conron, E. Andreakos, P. Pantelidis, C. Smith, H. Beynon, R. duBois, and B. Foxwell, manuscript in preparation). The observation that alymphoplasia mice displayed similar lymphoid organogenesis defects to LTα- and LTβR-deficient mice (48) led us to investigate whether NIK played a role in LTβR activation of NF-κB. For this study, we used primary HSFs that respond to LT as well as to TNF-α. A recombinant form of LTα1β2, which is normally membrane bound and demonstrates specificity for the LTβR, was used. Both TNF-α and LTα1β2 were found to induce IκBα degradation and NF-κB-DNA binding activity in HSFs, and this was not affected by infection with control Adv.GFP (Fig. 5⇓A). 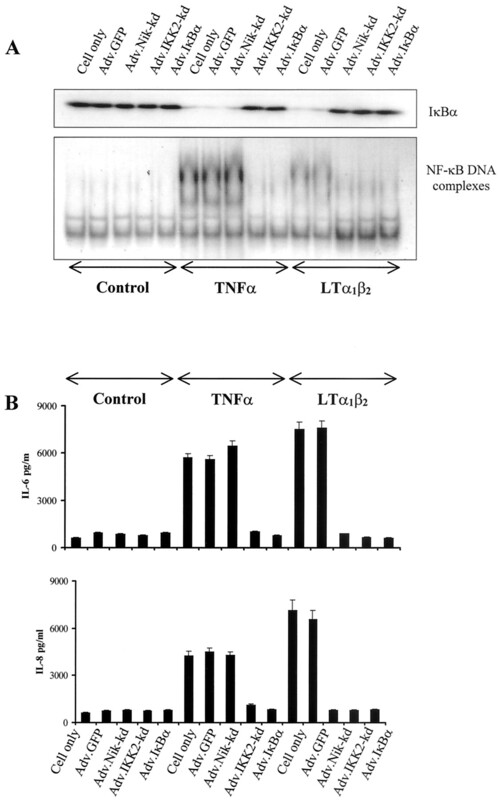 Adenoviral infection of NIK-kd into primary human fibroblasts blocked LTα1β2, but not TNF-α-induced IκBα degradation and subsequent NF-κB-DNA binding activity (Fig. 5⇓A). In contrast, adenoviral-mediated overexpression of IKK2-kd or IκBα was found to ablate IκBα degradation and NF-κB-DNA binding activity in response to both LTα1β2 and TNF-α. Similarly, induction of IL-6 and IL-8 expression was also NIK-dependent for LTα1β2, but NIK-independent for TNF-α (Fig. 5⇓B). The effect of NIK was specific for NF-κB, as the activation of p42 mitogen-activated protein kinase or p54/c-Jun N-terminal kinase by LTα1β2 as for TNF was unaffected by NIK-kd (data not shown). NIK is dispensable for TNFR, but essential for LTβR-induced NF-κB activation in primary HSFs. Primary HSFs were infected with Adv.GFP, Adv.NIK-kd, Adv.IKK2-kd, or Adv.IκBα (moi = 50) and left for 24 h to allow transgene expression. A, Cells were stimulated with vehicle (control), 25 ng/ml TNF-α, or 50 ng/ml LTα1β2 for 30 min, and cytosolic and nuclear extracts were prepared. Cytosolic IκBα levels were determined by Western blotting (upper panel). Nuclear NF-κB-DNA binding activities were determined by EMSA (lower panel). B, Cells were stimulated with vehicle (control), 25 ng/ml TNF-α, or 50 ng/ml LTα1β2 for 24 h, and secreted IL-6 and IL-8 levels were determined by ELISA (n = 3, ±SEM). The previous data indicate that NIK may play a restricted role in the signaling to NF-κB, in that it is required for LTβR but not by LPS, TNFα, or IL-1. Therefore, we were interested in examining what role NIK may have in the constitutive expression of TNF-α in synovial cells taken from rheumatoid arthritic joints, where the nature of the stimulus perpetuating TNFα synthesis is unknown. As shown in Fig. 6⇓, data from a representative donor showed that infection of rheumatoid-dissociated synoviocytes with Adv.NIK-kd was found not to cause any significant reduction (expression was 96% of control) in the spontaneous production by TNF-α by these cells and was comparable to Adv.GFP control (Fig. 5⇑). Studies in two other donors resulted in TNF-α production of 144 and 82% of control (a mean of 108 ± 31%, n = 3). Compared with adenoviral introduction of IκBα into these cells, which reduces spontaneous TNF-α production by >75% (Fig. 6⇓) (10), these data would suggest that NIK plays no role in the production of this cytokine in rheumatoid joints. NIK is inessential for constitutive TNFα production by primary rheumatoid synoviocytes. A, Dissociated rheumatoid synoviocytes were infected with Adv.GFP, Adv.NIK-kd, or Adv.IκBα (moi = 100). Cell supernatants were collected after 24 h, and secreted TNF-α levels were determined by ELISA. Data represent one experiment and are representative of three independent experiments using separate donors (±SEM). The data presented in this study are the first, to our knowledge, that demonstrate a restricted role for NIK in NF-κB activation in primary human cells. The importance of NF-κB in the processes associated with inflammation and infection has made elucidation of the components controlling the activation of this transcription factor the goal of much research. The identification of NIK as a TRAF-interacting kinase and its subsequent use in identifying IKKα appeared to place this enzyme central to the NF-κB activation pathway (25). This view was apparently confirmed by many subsequent studies that associated NIK with NF-κB activation by multiple and diverse stimuli. However, the majority, if not all, of these studies were conducted in transformed cell lines. The development of adenoviral vectors as a means of introducing transgenes into primary human monocytic cells and inflammatory disease tissue (10, 11, 59) allowed the role of NIK in NF-κB activation to be assessed in more physiologically relevant systems. The data presented here indicate that, rather than being a generic factor in the activation of NF-κB by many stimuli, NIK is selectively used in signaling by LTβR and does not appear to be used by TNF-α, IL-1α, or LPS. Moreover, there appears to be no role for NIK in the process involved in TNF-α production in the rheumatoid arthritic joint. These data highlight the problems of extrapolating observations from transformed cell lines to primary human models. The discrepancies between these data and those originally found in transformed cell lines have been reproduced recently in studies using mutant mice (48, 60, 61). The G855R missense point mutation in the IKK/TRAF binding domain of NIK has been described as being the molecular basis of the alymphoplasia (aly) mouse. (48). The similarities between the aly/aly phenotype and that of LTα- and LTβR-deficient mice suggested that NIK was essential for LTβR-dependent signaling. Indeed, while this manuscript was in preparation, LTβR-induced IκBα degradation and subsequent NF-κB-DNA binding activity has been shown to be deficient in aly/aly MEFs (60, 61). In contrast, aly/aly MEFs up-regulate NF-κB-dependent VCAM in response to TNF-α, and aly/aly mice demonstrate normal TNF-α-mediated endotoxemia in response to LPS administration (48). These data suggest that NIK use is stimulus specific. However, the presence of catalytically active, albeit mutated, NIK protein in these mice prevents decisive conclusions from being drawn. Especially as Shinkura et al. (48) found that the aly mutation did not preclude NIK from interacting with the TNF-α signaling pathway. This problem has recently been overcome by the generation of NIK−/− deficient mice (62). These mice generally recapitulate the phenotype observed in aly/aly mice, and NIK−/− MEFs demonstrate normal TNF-α- and IL-1-induced IKK activity (62). NIK−/− MEFs also show a specific impairment of LTβR function in agreement with our data and those of the aly/aly mouse. However, unlike the data presented here and those of the aly/aly mouse, LTβR-induced IκBα degradation and NF-κB DNA binding in NIK−/− MEFs remain intact. Instead, the lesion appears to fall at the level of NF-κB transactivation, a previously unknown but hypothesized role of NIK (62). Although these mechanistic differences appear at first to conflict, they could possibly be reconciled and explained by developmental substitution. The absence of NIK protein in NIK−/− deficient mice could permit substitution by a hypothetical IKK kinase closely related to NIK. Such a kinase could complement IKK kinase function in NIK−/− cells but be incapable of supporting transactivation, resulting in the effects observed. However, in the presence of aly NIK or NIK-kd, such a kinase would not be able to gain access to the IKK complex, i.e., be cross-dominated, thus resulting in the continued inhibition of IκBα degradation and NF-κB-DNA binding. The existence of such a kinase, of course, does not explain the lack of impairment in TNF-α or IL-1 signaling, etc., where NIK-kd and aly NIK are equally ineffective. The observation that NIK-kd failed to block TNF-α, IL-1α, and LPS signaling in a variety of primary cell systems, i.e., macrophages, fibroblasts, and HUVECs (data not shown), would suggest that there is not a selective use of NIK by these stimuli in different tissue systems, although this would have to be confirmed by direct experimentation. The ability of NIK-kd to block LTα1β2, but not TNF-α signaling, in the same primary human fibroblast cells shows that, in the appropriate setting, NIK has a role and that the failure of NIK-kd to inhibit other pathways is not due to the adenoviral vector approach. The selective use of NIK by LTβR, however, does raise the question of what role the kinase may have in pathological inflammatory conditions, such as RA, where a role for NF-κB has been identified (10, 11), although the primary stimulus for the transcription factor is unknown. There is preliminary evidence that a soluble LTβR Fc construct can inhibit the development of murine collagen-induced arthritis (63). The ineffectiveness of NIK-kd on TNF production by RA joint cell cultures, however, suggests that there is no role for NIK toward the activation of NF-κB in this inflammatory condition. Moreover, we have obtained similar data with another autoinflammatory disease, fibrosing alveolitis (M. Conron, E. Andreakos, P. Pantelidis, C. Smith, H. Beynon, R. duBois, and B. Foxwell, manuscript in preparation). However, it would be imprudent to preclude a role for NIK for other inflammatory conditions without direct study. Our data, in conjunction with the other studies discussed above, raise two other intriguing points. The discrepancy among the data obtained primarily from HeLa, HEK293 cells, and the human monocyte cell line U937 (40) compared with those acquired from human and murine primary cells could suggest that transformation, which promotes cell cycle progression and is associated with significant chromosomal abnormalities, implying gene dysregulation, can have a profound effect on signaling mechanisms and the components used. The fact that adenoviral introduction of NIK-kd into HeLa cells confirmed data previously obtained by transfection excludes the means of delivery of the transgene as an explanation for the different results. That transformation could have an effect on the role of NIK is supported by the observation that, unlike in primary cells, LTβR activates NF-κB normally in transformed aly/aly MEFs (61). However, it is difficult to understand the mechanism by which NIK has become involved in NF-κB activation in HeLa cells without further study. A simple explanation would be that transformation increases expression of NIK such that it dominates the signaling mechanisms used by TNF-α, LPS, and IL-1. However, we have not been able, nor to our knowledge have others been able, to detect endogenous NIK protein in any cell system. This may suggest that expression of this kinase is extremely low. The second disparate point raised by these data is that, whereas NIK appears to be inessential for TNF-α and IL-1 activation of NF-κB, TRAFs and IKKs, which are potential NIK interacting proteins, are required (64, 65). However, the ability of NIK to interact with these proteins has only been described in studies involving the overexpression of NIK (26, 35). Furthermore, these studies had been conducted in the same cell lines where NIK-kd was a successful inhibitor of TNF-α and IL-1 signaling. There is no evidence that TRAFs or IKK interact with NIK in primary cells or at normal levels of expression. For this reason, the data presented here cannot preclude the involvement of TRAF2, IKK1, and IKK2 in TNF-α, IL-1, or LPS signaling in the primary systems investigated. It is likely that TRAFs and IKKs associate with other signaling molecules in these circumstances. The natural question to ask, therefore, is the identity of the IKK kinase in LPS, IL-1α, and TNF-α signaling. One possibility is that no kinase is required, and recent data by Zhang et al. (66), showing that the IKK complex can directly associate with the TNF-α receptor complex, might suggest that this is the case (66). However, the fact that NIK is required for NF-κB activation by TNF-α, IL-1α, and LPS in the cell line studies and that signaling by LTβR in primary cells, a member of the TNFR family, may suggest that there is a role for an IKK kinase. A potential candidate could have been MEKK1, which has also been associated with NF-κB activation (32, 67). However, in our preliminary studies, infection of murine and human macrophages with a virus encoding MEKK1-dn failed to inhibit TNF-α and LPS signaling (data not shown). These data are in agreement with those shown previously in MEKK-1 deficient mice (68). In summary, these data have demonstrated for the first time, in human primary cells and inflamed RA tissue, that NIK has a selective role in signaling by the LTβR and is not a generic IKK kinase. Moreover, these studies have helped to resolve major discrepancies that have arisen in previous studies on NIK. The data also highlight the potential complexity of the pathways controlling NF-κB activation and the potential problems associated with extrapolating studies between primary and transformed cell lines. We thank Prof. Vogelstein, Prof. Wallach, Prof. Hay, and Dr. de Martin for the reagents used in this study; Sarah Field and Patricia Green for preparing RA synovial tissue; Prof. Wallach, Prof. Saklatvala, and Dr. Williams for helpful comments; and Siân Evans for typing the manuscript. ↵1 This work was supported by the Wellcome Trust and the Arthritis Research Campaign. ↵3 Abbreviations used in this paper: RA, rheumatoid arthritis; IKK, IκB kinase; MEKK, mitogen-activated protein kinase kinase kinase; NIK, NF-κB-inducing kinase; TRAF, TNFR-associated factor; LT, lymphotoxin; MEF, mouse embryonic fibroblast; moi, multiplicity of infection; HSF, human skin fibroblast; GFP, green fluorescent protein. Conron, M., J. Bondeson, P. Pantelidis, H. Benyon, M. Feldmann, R. M. deBois, and B. M. J. Foxwell. 2001. Alveolar macrophages and T cells from sarcoid, but not normal lung are permissive to adenovirus infection and allow analysis of NF-κB dependent signalling pathways. Am. J. Respir. Cell Mol. Biol. In press.